For more than 40 years, the seeds planted in Washington, D.C., by McLennan County native Bob Poage reaped rewards here in Central Texas. As U.S. representative from Texas' 11th Congressional District — a post he held from Jan. 3, 1937, until his retirement on Dec. 31, 1978 — William Robert "Bob" Poage served during a political era of great influence for congressmen of the Deep South, both on Capitol Hill and in the Democratic Party. 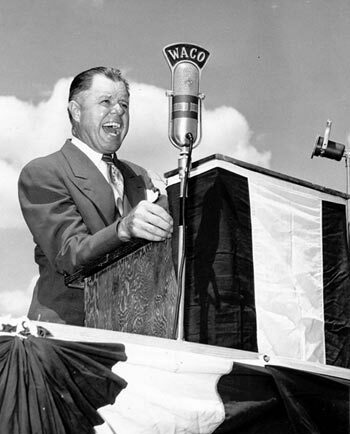 Born in Waco on Dec. 28, 1899 — he liked to say he lived "three full days in the 19th century" — Poage and his family moved to a cattle ranch in Throckmorton while he was a toddler. The family returned to Waco in 1913, and he graduated from Waco High School in 1918. In World War I, he joined the U.S. Navy, serving as an apprentice seaman. After a brief tour of duty, he attended Baylor University, graduating in 1921. He labored as a farm hand from 1920 to 1922, and taught geology at Baylor from 1922 to 1924 while working on his law degree. Poage was admitted to the bar in 1924, and practiced law in Waco while teaching at the law school until 1928. His first foray into politics resulted in his election to the Texas House of Representatives in 1924. He served four years. He returned to Austin as a state senator from 1931 to 1937. As a U.S. Representative, the young New Dealer campaigned for rural electrification and rural telephone service during the 1930s and 1940s. Despite others urging him to run for the U.S. Senate, Poage remained in the House through the 1950s, '60s and '70s, building up power and influence through seniority. Poage became chairman of the House Agriculture Committee in 1967 and held that position until 1974. In 1979, the W.R. Poage Legislative Library for Graduate Studies and Research was dedicated at Baylor. The facility houses not only Poage 's congressional papers, but also the papers of 12 other former U.S. Congressmen, six Texas legislators, five judges and more. Poage stayed busy by writing an autobiography, My First Eighty-five Years (1985), and four books on local history and politics: After the Pioneers (1969), Politics Texas Style (1974), McLennan County Before 1980 (1981) and How We Lived (1985). The congressman died in Temple on Jan. 3, 1987 — the 50th anniversary of his arrival in Washington — and was buried in Waco's Oakwood Cemetery. In recent weeks, Poage 's name has been on local lips with the auction of his effects and those of his late nephew, Scott Tabor Poage, who took possession of his uncle's belongings because Bob Poage and his wife Frances had no children.